While beachside resort towns like Cancun, Cozumel or Los Cabos get all the attention, quiet little San Miguel is a well-kept secret treasure. Once visitors experience this magical place set in the high desert mountains, they instantly fall in love, and many decide to make San Miguel their home. In fact, almost twenty percent of the residents of San Miguel are expatriates. What’s so great about this charming city? For starters, there’s the breathtaking and well-preserved Colonial and Spanish architecture. Most visitors’ minds are blown when the see the golden morning light draped across the gothic and pink limestone facades of the city’s buildings. There’s also the temperate climate, perfect for outdoor enthusiasts and adventure seekers; the vibrant art scene, and food that is off-the-charts delicious. It also doesn’t hurt that the cost of living in San Miguel is affordable, a fact that has been attracting more and more retirees, artists and writers from across the U.S., Canada and Europe. These people discovered the benefits of leaving their homelands to immerse themselves year-round in San Miguel’s cultural offerings and perfect climate. Interested in What’s Happening in San Miguel? 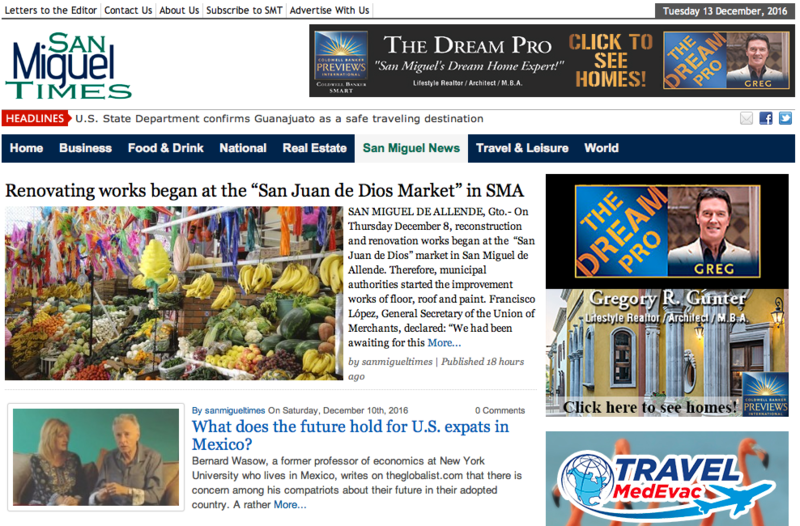 San Miguel Times offers local news, from a local perspective. Our goal is to serve the English-speaking community in San Miguel de Allende, Queretaro and the surrounding area with information that matters most to them. If you’re looking for news about real estate, business happenings, food and drink, national news, or about the people who make this city so great, the San Miguel Times brings you the latest on everything that interests our ever-growing expat community. Whether you view San Miguel as your next travel destination or your place of residence, the San Miguel Times publishes the most important regional, national and international news of relevance. Don’t forget to bookmark us!